Introducing Jon & Todd Marketing 604, a premiere team of REALTOR®s working to bring the best Real Estate Marketing service to clients in White Rock and Surrey. Jon & Todd Marketing 604 has a RealtyNinja powered website that they use to acquire leads, market their listings, educate potential buyers, showcase their projects and showcase their team. 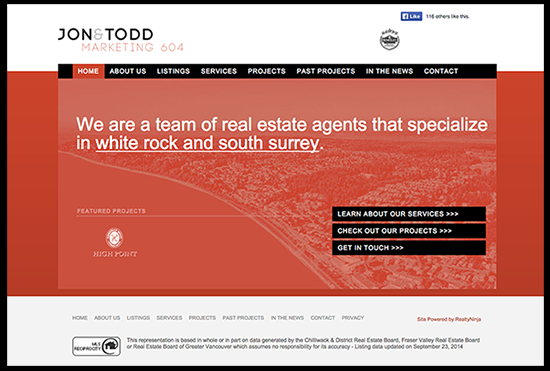 Unlike many other RealtyNinja powered websites, Jon & Todd Marketing 604 keeps the entire homepage ‘above the fold‘. They use the clean homepage design to explain in brief, who they are and what they do. They then direct your eyes to their Featured Project, then immediately to their three primary bulleted options which are ‘Services’, ‘Projects’ and ‘Contact’. When you roll over the ‘Services’ option in the main menu at the top, you’re presented with a number of written pieces and utilitarian tools for potential clients. Some simple resources can earn you serious brownie points with a potential customer. Often times customers will land on a real estate agent’s website simply by googling “Home Value Calculator”. 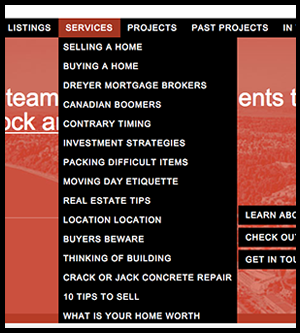 Many agents have picked up on this, and are now offering such tools on their websites. Jon & Todd Marketing 604 has covered many bases with a small library of resources. Great idea, Ninjas!